Teignmouth, United Kingdom A Royal Navy Bomb Disposal team based in Plymouth has been dispatched to Devon beach following reports of an unexploded bomb in the water. 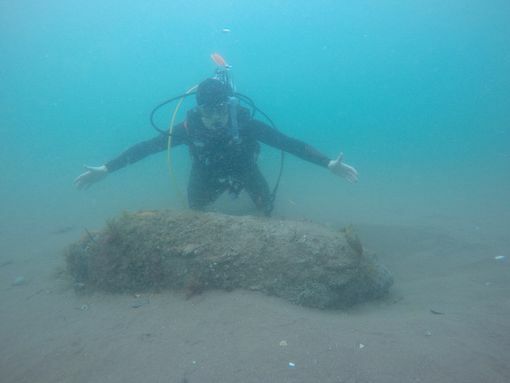 The UXO was discovered by two civilian divers north of Teignmouth pier. The divers took pictures of the item (shown below) before reporting the item to the police. Police and Coastguard have setup a 1,000 meter exclusion zone around the area and Coastguard issued safety broadcasts requesting that vessels stay clear of the area. Exmouth, Teignmouth and Torbay Coastguard Rescue Teams are also on scene providing support to the Police and the EOD. Navy EOD issued a statement which read in part: "The Southern Diving United have identified the bomb as a German World War Two airdrop weapon. We're in conversation with Devon and Cornwall Police and coastguards to determine how they're going to deal with the weapon..... Ideally what they would do is tow it out to a safe place and carry out a controlled detonation.....But they need to look at putting a cordon in place and there is a nature reserve in the facility as well so, they need to be mindful that we don't do any damage to that."